Sarah Chinn, left, and her son Gabriel Franklin on Aug. 19, 2014. PARK SLOPE — A Brooklyn group that named a kids' flag football team after the Washington Redskins agreed this week to change the team's name after a couple of outraged parents complained that it was racist. The Saint Francis Xavier Youth Sports league renamed the team after the Chicago Bears ahead of this year's season, which starts at the end of September, said Stanley Lehman, who helps run the league. “It was causing a controversy, and we’re more interested in having the kids play," Lehman said. 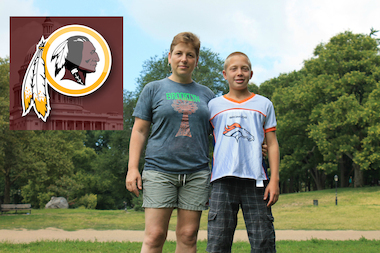 One of the parents who spoke out against the Redskins name was Sarah Chinn of Clinton Hill, whose 12-year-old son Gabriel Franklin was assigned to the team. “There is no other context, except in football, where you hear that term being used,” Chinn said, adding that she was astounded the name was chosen for a kids' team. The name of the Washington, D.C.,-based NFL team has been a contentious topic for decades, as many believe it constitutes a slur against Native Americans. Hundreds of national organizations have asked for the Redskins' name to be changed, and the U.S. Patent and Trademark Office recently canceled the team’s trademark, ruling it “disparaging of Native Americans." The Redskins filed an appeal last week, and the owner has said the name contains a proud history that should not be changed. The Brooklyn-based Saint Francis Xavier league launched its NFL-sponsored flag football program in 2007. Each of the league's 400 players, ages 7 to 16, are assigned to one of 32 teams split into different divisions and named after NFL teams. Volunteer coaches typically give the league three choices for team names, and then one is assigned to them by the league, according to Lehman. Each player wears a mini-NFL jersey, complete with team name and logo. Lehman said volunteer coach Edward Tully had picked the Redskins name. While Lehman was initially hesitant to approve it because of the controversy, he said he was swayed by Tully's insistence that the Redskins are a powerful, well-known team and kids would be proud to bear the Redskins name. The league also previously had a Washington Redskins team several years ago and no one opposed it then, league officials said. But after the team names were announced earlier this month, Chinn and at least one other parent posted complaints on the league's private online forum. Less than a day after DNAinfo inquired about the controversy, Lehman decided to change the name. Tully did not respond to requests for comment. Gabriel, Chinn's son, was glad to hear he would be playing for the Bears, not the Redskins. “I just don’t feel like walking around with a jersey that says Redskins on it,” said Gabriel, who has played in the league for the past two years. “I don’t feel good about that because it’s a racist name,” he added. Chinn's wife, Kris Franklin, said she was "thrilled" by the decision. "I wonder If I would have been able to be enthusiastic and cheering for my kid if they had kept the team's name," said Franklin, 47, a professor at New York Law School. “I think it’s great the league was conscious enough to change my team’s name,” Gabriel added, saying he was now "very excited" for the season to start.